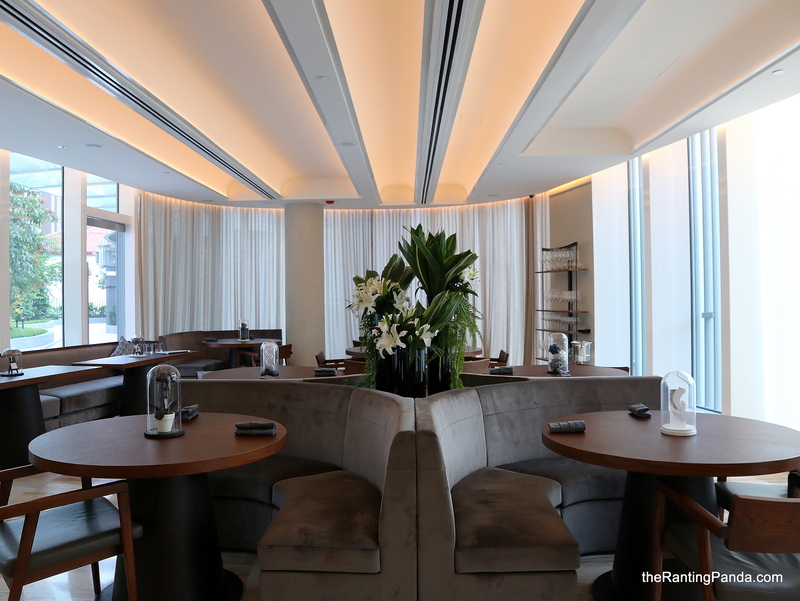 The Place Located in Frasers Tower, I was excited about checking out Preludio after hearing that it is helmed by a Colombian chef. The restaurant is located on level three of the relatively new office building where The Mast is located as well. Head Chef Fernando Arévalo hails from Colombia, and was previously heading the kitchens of Bistecca Tuscan Steakhouse and Artemis Grill. The name of the restaurant takes inspiration from the word prelude, where there is an underlying belief of alluding to the constant beginning of something new. That is seen from the conceptualization of the dishes and menu, which I will share more later. In terms of interior, Preludio takes on an elegant and contemporary space, using soothing monochrome colour. The restaurant is split into three main sections – the 44-seater main dining area, a private room and the lounge where you can get cosy with a drink on hand. The Food There is no particular focus on a specific type of cuisine at Preludio, but rather, it seems to unveil a new “chapter” every 12 to 18 months with the first chapter being “Monochrome”. Expect worldly dishes inspired by black and white, which I was curious how it will play out during the course of my meal. I tried the 8-course degustation menu (S$218++), along with additional S$158++ for wine pairing. Dinner starts from S$168++ (additional $132++ for wine pairing), while lunch starts from 4 courses at S$55++ (choice of mains), or 7 courses at S$98++ (chef’s selection). For a start, I would have expected some bread to be served as with most fine dining restaurants in Singapore but Chef Fernando is not a firm believer of ruining your appetite with bread. Instead, we started with an amuse bouche of fresh hamachi slices, not that I’m complaining. The first course proper is the Elude. The colour is distinctly white, and it stems from the French white beetroot with burrata, walnut crumble, dil-marinated cucumber, yogurt foam and topped with luxe Primeur Sturia caviar. The Artigiana burrata here is sourced from Italy, which has a mild yet delicious touch to the taste. Each component like the yogurt foam is well-balanced and forms a harmonious starter. The next course is the Allude, which also happens to be one of my favourite page of the chapter. The presentation deliberately alludes to the first course, the Elude but it is vastly different. Mix mushrooms with bone marrow, and the resulting is a taste I enjoy. The dish has elements of fermented mushroom, bone marrow, thyme croutons, preserved Amalfi lemon, mushroom potato mousse and Oscietra Sturia caviar. It looks creamy, but it isn’t. The bone marrow flavour is subtle, which is quite a challenge to balance with the mushroom component. The third course is the Peek A Boo, which comes in a mysterious looking white cracker. The contents within are revealed by hitting through the light and crisp white rice cracker, which contains smoked eel, lampascioni bulb, girolle mushrooms, heliantis, crosnes, salty fingers, viola flowers. The vibrancy of the colours of the ingredients is a nice juxtaposition with the black and white monochrome theme. I enjoy the sauce here too, which is a creamy concoction of egg yolk emulsion with hints of yuzu. Moving on to the more substantial mains, the next course is the La Cortina, agnolotti pasta with butternut squash and amaretto filling, parmesan sauce, almond snow and a 25 year old balsamic vinegar. I like how the balsamic vinegar complements the slightly creamy and cheesy flavour of the pasta, and all I can say is that I could do with more serving of it. Moving on, I had the first meat dish of the degustation menu, the White Opal. This is essentially the Patagonian toothfish, served with cauliflower purée, crunchy shallots, leek and almond milk bubbles, pickled fresh almonds and black olive powder. The flavour profile of this dish is quite light, which leads up well to the next meaty dish. This is the dish with the heaviest flavour profile of the night, the Pata Negra. I initially thought that it is beef but it turns out to be Iberico pork. It is glazed to a glistening texture, coated with squid ink panko bread crumbs to give it that black hue. The pork meat is very tender, which is a shoulder cut of the pork after being marinated with a mix of spices for more than 12 hours. The surprise here for me is the tingle of spiciness, from the paprika used in marinating the meat. The last part of the meal are the desserts, which come in two parts. The first part is the Irezumi, which is salted black sesame ice cream with sesame snow, yuzu white chocolate ganache, strawberries with lime zest and baby basil. It is not too sweet, yet you get the intensity of the black sesame. The last course is the Gorbea Mountain, made up of blueberry mousse, yogurt sponge, yogurt ice cream, Idiazabel cheese, blueberries, blackberries and milk foam. The star here for me is the Idiazabel cheese, which I thought would be overpowering but it is relatively mild given that it is made from sheep’s milk. And of course, yogurt ice cream is always a good idea to conclude a meal. Last but not least, we had the Petit Fours, a combination of Tropical fruits white chocolate bon bon, orange and coffee dark chocolate bon bon, vanilla chantilly filled pate choux and white truffle macarons. My favourite is the white truffle macaron, great texture on the mini crust with the right hint of truffle to awaken your senses one last time. Rants For dinner, do budget at least 2.5 to 3 hours, which is not ideal if you do not have the luxury of time. Will I Return Again? The Monochrome concept of Preludio is strong, with every dish being executed close to the theme. There is a gradual build-up of the dishes from the beginning to end, and I enjoyed the overall dining experience. It may just be the start of the year, but I am quite sure Preludio will be one of my favourite new restaurants of the year already.